Seattle based songster Steve James is a blues musician, a notable songwriter, one of the best modern bottleneck slide players, a storyteller and a compendium of interesting facts. In the world of contemporary acoustic and roots music, he’s earned his reputation with decades of tireless international touring, a stack of solo recordings, a funny, kinetic stage presence and an unmistakable style of playing and singing. His own recordings engage with other top notch musicians- Cindy Cashdollar, the Bad Livers, Alvin Youngblood Hart. As a sideman, both on stage and on record, he’s played with Bo Diddley, John Hammond, Maria Muldaur, Furry Lewis and James McMurtry…& host of other notables. 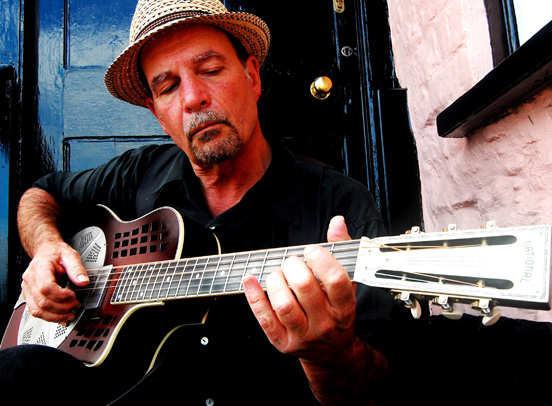 Lee Bates is a very hard working local bluesman/guitarist & at the top of his game.